John Williams makes a rare Brooklyn appearance at a SUNY board meeting last May. One man stands leading that charge: SUNY Downstate President, Dr. John “Skip” Williams. In a press release from the same day, SUNY said, “We commend Dr. John Williams and his team at Downstate Medical for their commitment to preserving and ultimately strengthening this hidden jewel of the SUNY system,” by closing LICH. SUNY officials may have put plans in place long before Williams was hired, as suggested by Kings County Brooklyn Supreme Court Justice, Carolyn Demarest. In August 2013, she overturned her original decision to grant ownership of LICH to SUNY Downstate Medical Center (DMC). “The wave of enthusiasm for a solution that would preserve LICH may have blinded many to a more sinister purpose to seize its assets and dismantle the hospital,” she wrote. Dr. John LaRosa preceded Williams as President of DMC from 1999 until June 2012. Prior to that, LaRosa served as the chancellor of Tulane University Medical Center. From 1987-1991, he served as dean of clinical affairs, and dean of research from 1991-1994 at George Washington University (GWU). During LaRosa’s time at GWU, Williams was working first as an assistant professor of anesthesiology, then as an assistant dean for admissions, and finally, as Associate Vice President for Graduate Medical Education and Special Projects at GWU. The Times also noted “the latest disruption to face the institution” may have been the result of “an [April 2012] audit spurred by anonymous tips [that] revealed fake bids for construction contracts and other procurement problems.” LaRosa had also “criticized [the] recommendation” of the Medicaid Redesign Team to consolidate services into LICH, and was himself highly criticized in the Stromberg Report. However, Taylor’s appointment was much briefer than “several months,” as he had anticipated as the process for replacing a major medical school president can be lengthy. Taylor held this position for 49 days – only 7 weeks – before Dr. John “Skip” Williams was hired and took the helm. Williams’ salary totals $650,000 plus amenities: $350,000 in state salary; $300,000 of “annual compensation from other sources;” up to $80,000 per year for housing costs; and use of a campus vehicle. In addition to the increased salary, Williams will be “eligible for two merit pay bonuses” of $25,000 each “after the conclusion of nine and eighteen months of service.” His contract, surprisingly, is only for two years. LaRosa – after 13 years – was earning a salary of $605,000 annually, plus $66,000 a year for housing and use of a university vehicle. Despite SUNY’s financial woes, Williams’ annual paycheck included an extra $45,000 with a $14,000 housing increase for his first two years. Before being hired at SUNY Downstate as President of the medical school, Dr. John Franklin Williams, Jr. spent nearly three decades at George Washington University (GWU). After completing his residency there in 1982, he quickly rose through the ranks, eventually becoming Provost for the school in January 2003. At the same time he also served as the Vice President for Health Affairs, professor of Anesthesiology and Co-Director of the Intensive Care Unit (ICU) of George Washington University Hospital (GWUH). In 2009, The Washington Post reported that Williams’ income totaled $772,500. 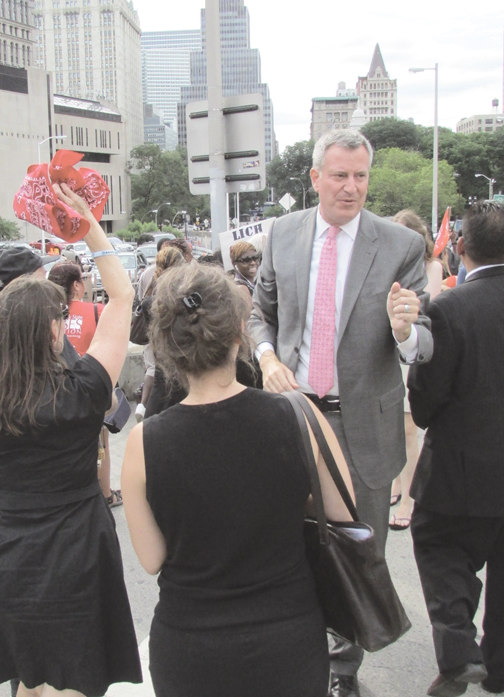 Bill de Blasio walks with LICH supporters over the Brooklyn Bridge last summer. In October 2008, GWU’s School of Medicine and Health Sciences (SMHS) was put on probation by the Accreditation Council for Graduate Medical Education (ACGME) for “being out of compliance on several standards,” The Washington Post reported. The article also noted that the evaluation placing the school on probation was the reason for the evaluation, but not the cause of the probationary status. The ACGME is based on established guidelines and standards for post-MD medical training programs in the US. All graduating doctors must graduate from an ACGME accredited school to be certified. Probationary status means the school must correct any violation, or risk losing their accreditation. “GWU has done an inadequate job of monitoring students’ time with patients and ensuring that those clinical experiences relate to classroom learning. Student debt levels are among the highest in the country. “Students complained of mistreatment. Problems flagged as long ago as 2001 still had not been addressed when the school was put on probation,” The Post reported. After more than fifteen months, officials announced the GWU medical school had been taken off of academic probation in February 2010. GWU’s accreditation “never lapsed” and credibility of the medical programs’ degrees did not suffer as a result. Two years later, Williams was facing complaints about the residency program at LICH and would have to face another evaluation. By eliminating the residency program, investigation of complaints could not be evaluated. Downstate pulled the residents and did not replace them, manufacturing their own staffing shortage. In mid-July 2013, Downstate was placed on academic probation, again under the leadership of John Williams. The “unfavorable status,” as defined by ACGME was issued because SUNY is under contract for two residential sites; after removing residents from LICH, Downstate was only maintaining one. A LICH staffer rebutted, saying, “[The] ACGME acts on facts, not phone calls,” and that Downstate’s removal of residents from LICH was the culprit. However, as previously reported in the Star-Revue, SUNY Downstate did anticipate “difficulty” with the ACGME’s upcoming visit, and forced the heads of the three remaining residency programs to “voluntarily” withdraw their residencies temporarily. Once the withdrawal was complete, SUNY announced the withdrawal would be permanent. In addition, the National Resident Matching Program (NRMP) results for LICH in 2012 included four programs: Internal Medicine; Obstetrics-Gynecology (OBGYN); Medicine Preliminary; and Radiology-Diagnostic. In 2013, SUNY did not register any NRMP positions for LICH. The deadline for an institution to change a quota for 2013 residents was January 31, 2013 – eight days before SUNY’s first illegal vote to terminate LICH. The Match results were announced on March 15, 2013. SUNY’s letters to residency programs to “voluntarily withdraw” were sent on May 20, 2013. Downstate had decided well in advance not to continue residencies at LICH. The ACGME website also shows the voluntary withdrawal from the radiology department, but as of press time shows continued accreditation in the OBGYN and internal medicine programs. Combined, both programs show 78 approved and filled positions for the 2013-2014 academic year. In addition to those residencies – for which SUNY did not apply in the 2013 NRMP match, LICH continues to be listed on the ACGME website as a required rotation site for at least 20 of SUNY’s 53 listed residencies. Williams also announced over the summer that the Liaison Committee of Medical Education (LCME) also issued SUNY Downstate a warning. Graduates of LCME accredited programs are eligible for residency programs accredited by ACGME. Williams at the May board meeting. Dr. Ian Taylor, Dean School of Medicine at SUNY Downstate Medical Center, reported back to the Board of Trustees at the September 11 General Board Meeting concerning the LCME accreditation. “Although we were fully accredited at the meeting last February, [LCME] had two major concerns,” Taylor said. “They’re going to come in and look at the roll out of the new curriculum; that is one of the issues. LCME has required SUNY to submit a full progress report to the Board by December 1, 2013, which SUNY anticipates will result in another “limited” site visit to look at the financial and curriculum statuses. For the time being, SUNY Downstate’s website claims the school “enjoys full accreditation” by the LCME. Based on the revelations from The Washington Post during his tenure at George Washington University and his lack of transparency toward LICH, the concept that there may be more to the currently probationary status than Williams is revealing. However, ACGME does not release detailed reports for probationary statuses. 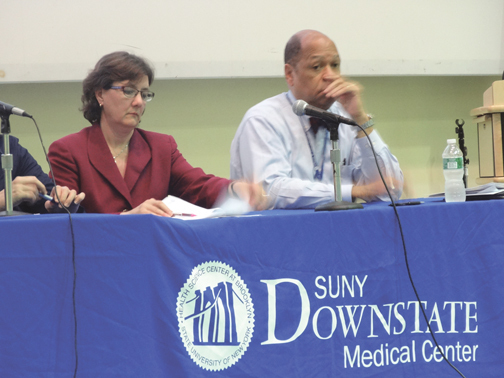 SUNY Downstate is still on probation under appeal with ACGME. As long as LICH’s residency program is discontinued – and the hospital still exists – SUNY Downstate remains in jeopardy of losing their national accreditation with ACGME and possibly LCME as well. Even if LICH is transferred to another operator, SUNY will still be obligated to have two residency programs: one at UHB; the other at LICH. Because SUNY has contracts for residency programs at LICH – and did not maintain those contracts – they are in jeopardy of losing their accreditation with ACGME. In the NMRP, SUNY did not register LICH by January 31, 2013, and until the end of the 2013-2014 year, they cannot place residents at LICH. But the ACGME still has internal medicine and OBGYN residencies listed through 2014, putting SUNY in violation of their contract with ACGME. The only way to avoid losing their accreditation with ACGME at this point is to close LICH. In addition, SUNY has been issued a warning by LCME because of their financial situation. Because SUNY is not allowing services at LICH but cannot lay off workers, the medical school is losing even more money than when LCME first issued the warning. They are also in jeopardy of losing their accreditation with LCME. Losing their accreditation with LCME or ACGME would effectively ruin the medical school. SUNY is in “unfavorable standing” with both agencies. This creates extreme urgency to close LICH, thereby salvaging SUNY Downstate. The LCME and ACGME are both national agencies. State officials, including SUNY’s Board of Trustees and Governor Cuomo have no political room to maneuver agreements; either SUNY complies, or they lose accreditation. ACGME’s review should occur approximately one year after the initial review in May 2014. For SUNY, everything hangs in the balance of those reviews. LICH may lead to the downfall of the medical school simply by staying open. George Washington University Hospital (GWUH) was founded in 1824. The hospital was partnered with the university for 173 years. The Washington Post reported that GWUH experienced huge financial losses. “The facility was losing money and sapping the school’s endowment.” As a result, the hospital was closed, torn down, and a brand new facility was built – a state-of-the-art for-profit hospital. The old hospital, built 1949, was called a “tired old building.” The new facility opened in 2003 in a parking lot across from the old hospital site. In 1997, GWU sold 80% of the hospital’s shares to Universal Health Services (UHS) during Williams’ tenure as Vice President for Health Affairs. GWU only maintains a 20% stake. In January 2003, Williams was named Provost – or senior academic administrator – of GWU. On August 23 that same year, George Washington University Hospital closed the doors. The new facility housed 371 beds and $45 million of medical supplies. The hospital cost a total of $96 million to build, mostly funded by UHS. On February 6, 2009, The GW Hatchet published the article “Provost’s dual roles questioned.” At the time, Williams was serving as both University Provost and Vice President of Affairs, “the second most senior administrator at the university.” He was also on the Board of Directors of University Health Services. According to the article, Williams was paid $709,005 from the university and had also received more than $750,000 plus “valuable stock in the Fortune 500 company” since 2001 from UHS. “His dual positions may have posed a conflict of interest because Williams is tasked with both improving the academics of the medical school and keeping an eye on UHS’s profits. Given his two roles, Williams could theoretically choose to ensure the hospital’s profitably and forgo investing in upgrades and training that could benefit medical students and faculty,” the article claimed. University President, Steven Knapp, GWU’s Board of Trustees all asked Williams to step down from the position with UHS. Law professor at the school, Theresa Gabaldon told The Hatchet, “One of the problems is [Williams] was beholden to the management,” his friend and CEO, Richard Becker. Richard Becker, served as CEO/Managing Director at GWUH from March 2004 until May 2008 and previously as medical director during Williams’ tenure on the for-profit board. Williams and Becker were colleagues at GWU and have been close friends for more than 30 years. While Williams declined to talk to the press about the issue, he did resign from the board, giving up his “six-figure salary and stock options.” Becker, at that point, became CEO of Brooklyn Hospital, which would benefit greatly from the closure of LICH. On November 30, 2010, Emily Cahn of The GW Hatchet broke the news that Williams was resigning at the end of the year after “senior officials at the University pushed him out of his position,” after more than 30 years of employment. The Washington Post reported Williams was “being removed from [his] position six months into a[n internal] university review” because the school “no longer wants him in that position.” They also reported that Williams, who had tenure with the university, “hired an attorney to negotiate an agreement.” According to the university’s 2009 tax returns, Williams earned $912,839 at the end of the fiscal year in June. Williams must have suspected his position with GWU was vulnerable because on April 1, 2010 – nine months before he announced his resignation, the City University of New York (CUNY) announced him as one of four finalists for President of City College of New York (CCNY). The presidential search committee of CUNY originally chose twelve semi-finalists, before narrowing the search to four. According to CUNY’s website, the each finalist spent a day at the campus. Williams attended on April 6, 2010. He was the first finalist to visit CCNY. After his one year sabbatical, Williams was hired as Senior Vice President at Verras Health Care International in May 2012. Verras provides analysis and “risk-adjusted data” to hospitals to improve financial and clinical outcomes, according to their website. Williams only worked there for three months before accepting the position of President of DMC. After working with GWU – under tenure – Williams was forced to resign. 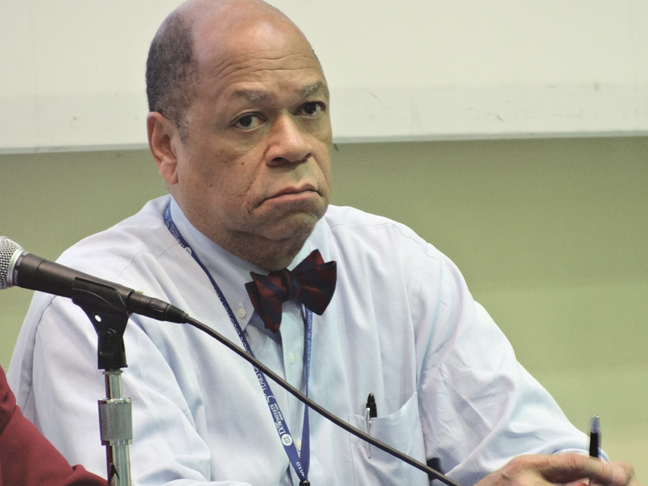 Under his leadership, the university faced academic probation, was forced to sell off more than three-quarters of the university hospital to a private entity, and Williams himself raised concerns about the hospital’s bottom line versus quality student investment. Now, in the SUNY Downstate system, his focus remains on the bottom line, while he has again landed his residency program on probationary status, is trying to sell off LICH’s 18 essential hospital buildings to build a new hospital in Central Brooklyn, and is being examined about the business enterprise of SUNY. This entry was posted in LICH and tagged Dr. John 'Skip' Williams, GWU, LICh, Nancy Zimpher, SUNY Downstate. Bookmark the permalink.